Thanksgiving evening I stopped by a large store started by a guy named Sam. It was packed. Had a huge problem finding parking within a couple of hundred yards of the entrance. I would bet the number of people in the place was at the capacity allowed by the fire inspector. Then there were the aisles jammed with people pushing carts loaded with all manner of stuff. High-cost stuff in carts overflowing. Just how many big, flat-screen televisions does one guy need? Then there were the additional pallets of stuff to be sold, also jamming the aisles. It was crazy. All I wanted was some distilled water and paper products for my bathroom. I gave up. The checkout lines looked to be 15 to 20 people deep at all registers, and all of them were open. Also had to stop by my pharmacy to get a refill on my meds. They had everything I needed. No crowds or pallets of stock jamming the aisles. Lots of folks but no pushing or shoving, and not a single flat-screen TV to be seen. How did Christmas turn into a mass shopping frenzy? Why do we suddenly need all this stuff when we could buy it just about any time? And how many flat-screen TVs does one person need? 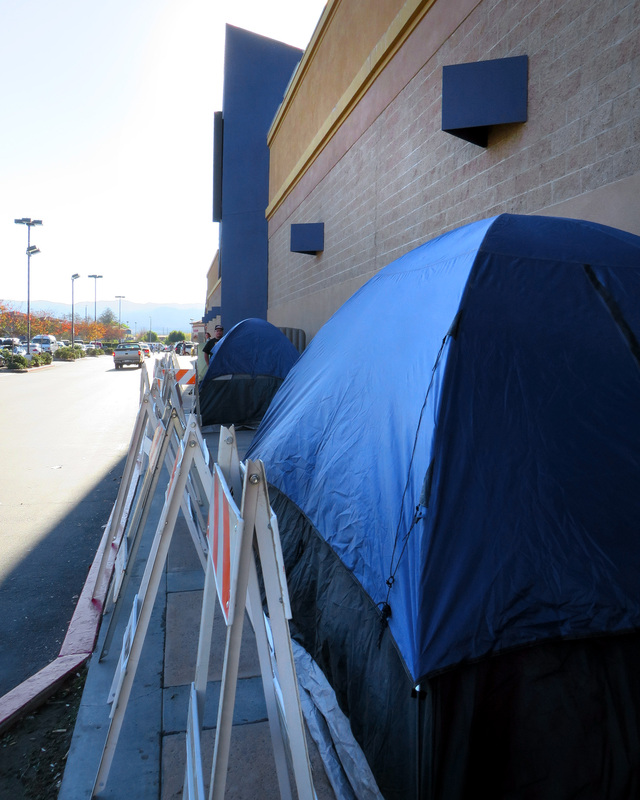 What is with those folks who camp out at a store many days in advance of Brown Thursday or Black Friday? How much do they save by doing that? It must be worth it. Sleep on a sidewalk for a week and save maybe $100. Wow. Was that worth it? All of that time away from your family to stand in line to buy something, when what the family needs is time with you. Is that what Christmas is about? Fighting over the last “must have” item on the shelf. Rushing to get into a parking place that three other people want. Yelling. Screaming. Anger running amok. Is that what Christmas is about? We complain about how kids are today. Guess what? My folks complained about me, and their folks about them, and on and on, but we had a lot of time together as a family. We did some Christmas shopping for special items. When I was eight, my father would stop at a bike shop in Santa Paula almost every day to look at the bike he wanted to buy me. It was a lot of money. A 3-speed model. Black and silver. The day came when he bought it. I know my folks went without something so I could get that bike. Not sure what that was. And there was the day I got that bike. Christmas day. What joy. I’ll never forget. Up here in the SCV, one of the best events at Christmastime was the annual trip to Panorama City to see Santa and his reindeer. Real live reindeer. While we kids were looking, the folks were shopping. Santa needed help. Is that what Christmas was about? The bike was about the biggest thing I ever got for Christmas, and the best, because it means even more today when I know what my father did to get it for me. Is that what Christmas is about? We all should know the real reason for Christmas. We have nobody but ourselves to blame for the shopping and the rush and the crowds and the sales and the … sure isn’t the meaning of Christmas. Maybe the best gift we can give is the gift of time. Time to help someone who needs a helping hand. Time to say “hello” and give a smile to someone stuck in those long lines. Time to be with our families and friends. The gift of time. I don’t have the answer here. I’ve got only the questions. Maybe that is closer to the meaning we are really looking for right about now. I’m not saying you shouldn’t shop and do the hustle and bustle of the season. Sometimes I like to sit in one of the stores and watch the people doing just that. I leave the anger and stress at home. My cart might not fill, but I grow fascinated by what I see happening. I smile. I give a hearty “hello” to anyone I see, followed by “Merry Christmas.” Is that the meaning of Christmas? I know one thing. It isn’t a cart full of flat-screen televisions.